The Credit Rating Agencies, the OECD and the World Bank continue to forecast ­– and perhaps also induce – worse to come in the World Economy, prompting further austerity measures, cuts, privatisations and rounds of QE (not Queen Elizabeth but Quantitative Easing: Printing Money without printing it but electronically making it available to banks). The EU demands that high unemployment stricken Greeks work a longer week (!?) and rescue packages to banks disappear into the black holes of Tax Havens. Climate Change forecasts disasters but the Chinese are blamed for “dumping” cheap solar panels on Europe – and for increasing their carbon footprint as we outsource them industrial production, whilst expecting they should save the global economy. The – many and varied – sane economic alternatives are dismissed outright. Not everything is what it seems. The culture of today’s global financial ethos is one of consumerism (“I shop therefore I am”), mass production and economic growth followed by periods of “recession” during which the most successful companies buy out or force the weaker ones to close in a process of progressive concentration never seen before in the history of humanity. Rapid speculative profit rather than long term investment creates a sense of uncertainty and instability where only having lots of money (never enough, in fact) can protect a member of this system’s image of the future. In this way only money, a meaningless convention, rather than the creative process of production, acquires any weight in the scale of society’s values. Human relationships are marked by relentlessly stressing the advantages of individualism, competition and success. Existential emptiness is filled by the progressive development of the entertainment industry. The senses are caressed by visual images, music, and the opportunity to live vicariously the life of heroes and heroines, celebrities and victims of atrocities, princesses and murderers, all from the comfort of our own living room, whilst the values of the pervading system are absorbed uncritically. But sometimes something does not make sense, and it makes us wonder: “Woman plunges to her death from top restaurant that has become suicide spot for City (London’s Financial District) workers.” How many? Three, between 2007 and 2012; all successful members of the Financial Sector workforce, with different stories but immediately bringing up memories of stockbrokers’ mass suicides in the 1930’s crash. According to Macleans there were 6 stock market related deaths in Wall Street during 2008. Different sources put the 1930 death tall at around 23,000. It’s one of the most deeply ingrained images of Wall Street during the crash: the distraught stockbroker out on the window ledge. 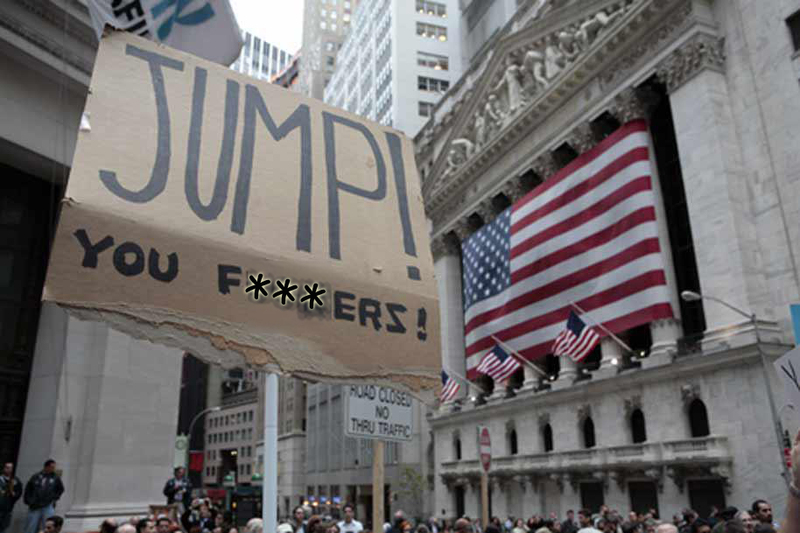 During the bank bailouts in September, protesters outside the New York Stock Exchange carried “Jump you f***ers” placards. Enter QE, inject money into the economy, save the banks, try to control de inevitable inflation that will ensue and fail again to kick-start the economy. The reason? The collective wealth of the Britain’s’ 1,000 richest people rose by 30% in 2010 in the wake of the economic crisis. In New Zealand the richest 150 increased their wealth by 20%. Very simply, a system designed to concentrate wealth will continue doing so unless the rules are changed. More importantly, “growth” is not synonymous with “well being” and unless human markers rather than monetary ones take centre stage we will not be able to address the real suffering created by this system. Suicide is always difficult to understand, more so if people are not listened to. Aggression? Riots? Domestic violence? Racism? Substance abuse? Blame the individual, nothing to do with society. Big Money, Big Oil, Big Pharma and Big Arms Trade, are all enjoying record profits. But they are not the only ones navigating through the crisis without too much trouble. In fact, it is not necessary to sell your soul to the devil to remain economically viable. There are many examples of companies and towns that sticking to high human centred moral principles organise themselves for stability and growth. Many people are surprised when told that John Lewis, the swish high street department store and its subsidiaries, is owned by its workers; a cooperative, or partnership, where the employees are the shareholders as profits are distributed amongst all, as bonuses. It was of course affected by the downturn but the reduction in bonuses (on average 18% of the salary) was just of 3.5%, (for the first time in 3 years) with no layoffs and the creation of 4.400 new jobs. The Mondragon Corporation is a federation of worker cooperatives based in the Basque region of Spain. Founded in the town of Mondragón in 1956, currently it is the seventh largest Spanish company in terms of asset turnover and the leading business group in the Basque Country. At the end of 2011 it was providing employment for 83,869 people working in 256 companies in four areas of activity: Finance, Industry, Retail and Knowledge. Scholars such as Richard D. Wolff, American professor of economics, have hailed the Mondragon set of enterprises, including the good wages it provides for employees, the empowerment of ordinary workers in decision making, and the measure of equality for female workers, as a major success and have cited it as a working model of an alternative to the capitalist mode of production. Whilst Spain’s unemployment level is around 22 per cent, the Mondragon co-operatives have shown impressive resilience that has enabled them to take their share of economic hits and emerge largely unscathed. Juan Manuel Sánchez Gordillo, mayor of Marinaleda in Andalusia, Spain, has become famous for staging robberies at supermarkets and giving stolen groceries to the poor. During his 30 years as mayor he has introduced a cooperative farming system in Marinaleda and has repeatedly tried to take over land for farming, the latest target being 1,200 hectares of land owned by the Ministry of Defence. Cooperativism and Commoning in action, in Marinelada nobody goes hungry. We have already published in Pressenza UN General Secretary Ban Ki-Moon’s report/celebration of Cooperative Banks for their resilience in the crisis. Towards a Cooperatives-Only Monolithic System? 1. Amongst Galbraith’s famous phrases: “Under capitalism, man exploits man. Under communism, it’s just the opposite.” “The modern conservative is engaged in one of man’s oldest exercises in moral philosophy; that is, the search for a superior moral justification for selfishness.” He was a Keynesian and his BBC series The Age of Uncertainty so incensed the then leader of the British Conservative Party, Margaret Thatcher the ultra-neoliberal Milton Friedman was brought over from Chicago to lecture against Galbraith’s economic viewpoints. As Ecuador offers asylum to Julian Assange at its London Embassy with the Foreign Office doing Olympic-size legal somersaults to try to justify storming it, we hear that both the UK and the US have been helping the Syrian rebels, secretly, without any consultation with their parliaments, just to prove the point that we need Wikileaks to know what our governments are up to. Nobody other than completely self-deluded megalomaniacs (they are still kicking about, I’m afraid) would try to pull again the Iraq WMD trick on Parliament/Congress. The next best thing is to go ahead and engage people and resources in a new war, without telling the public; a public whose taxes pay for such engagement, a public that becomes the target of “the enemy” faction without having any choice in the matter. The UK Royal Prerogative allows the Prime Minister to declare war without consulting Parliament, and surreally enough The Prime Minister is voicing his desire to limit it, whilst using it give help to one side of the Syrian civil war. He would argue, I imagine, that there is no war declaration, but this is the new face of war, war by euphemism. “Giving non-lethal help”, “just communications”, “training”, “stepping us financial help” (surely the Syrian rebels will not buy sweets with it! ), etc. As for the US, although the Constitution clearly states that only Congress has the power to declare war, this has been regularly circumvented by various administrations with the help of not-too-keen-on-consulting-elected-bodies secret services, endlessly depicted by Hollywood as our saviours (disobeying orders, bending rules and NOT consulting Congress seems to be part of the job description). Which brings us back to Julian Assange, beans-spiller extraordinaire, holed up at the Ecuadorian Embassy in London after being granted political asylum. He is not refusing, he claims, to answer to the (still to be formally brought) charges of sexual assault in Sweden, but attempting to avoid extradition from Sweden to the US where he would most likely be charged with espionage, or treason, and executed. Alternatively, another old favourite would be getting shot by a “crazy” who would then be shot by another person, so that Oliver Stone could make a film about unverifiable conspiracy theories. Under international law, police are not allowed to enter the embassy without the express permission of the ambassador. This “rule of inviolability” was dictated by the 1961 Vienna Convention on Diplomatic Relations and all nations observe it because their own diplomatic missions would be otherwise at risk. However, the Foreign Office has threatened Ecuador with revoking the embassy’s diplomatic status under the Diplomatic and Consular Premises Act 1987, passed to enter the Libyan embassy after a policewoman was shot dead outside, presumably from a window. This would certainly establish a dangerous precedent regarding diplomatic asylum all over the world. In recent days the FO seems to be backing down from this. Needless to say that Rafael Correa’s Ecuadorian Government is being subjected in Britain to a smear campaign only comparable to the one he suffers in his own country at the hands of the traditional corporate media, where any attempt to limit its onslaught on the government (Honduras and Paraguay are examples of success in bringing down popular governments through relentless media campaigns) leads to accusations of curtailing the Freedom of the Press. Democracy may rhyme with secrecy but they do not go well together, and the fuss surrounding the founder of Wikileaks speaks for itself. How can parliaments make decisions without information? How can the public vote without information, just the propaganda of political parties? Information is power and those who are attempting to democratise it are feeling the full weight of the system’s elites intent on keeping its monopoly.